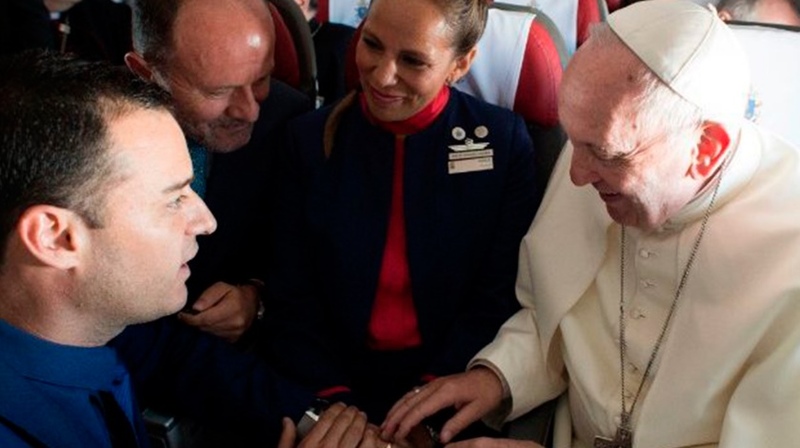 Last Thursday, the Holy Father Pope Francis delivered the sacrament of marriage to two cabin crew members onboard LATAM flight LA1250 from Santiago (SCL) to Iquique (IQQ) in Chile. The ceremony was witnessed by Ignacio Cueto, Chairman of LATAM Airlines, along with Monsignor Mauricio Rueda, both of whom are part of the delegation accompanying Pope Francis on his visit to Chile and Peru. During the flight, the couple approached Pope Francis asking for his blessing. However, when the Pope asked about their personal lives, both crewmembers explained that the Church where they intended to get married was destroyed by the earthquake that hit Chile in 2010. The Supreme Pontiff, instead of blessing them, offered to perform the Sacrament of marriage onboard the plane. “We approached the Holy Father to ask for his blessing, but after an intimate conversation, he agreed to marry us,” explained Carlos Ciuffardi Elorriaga, the groom. 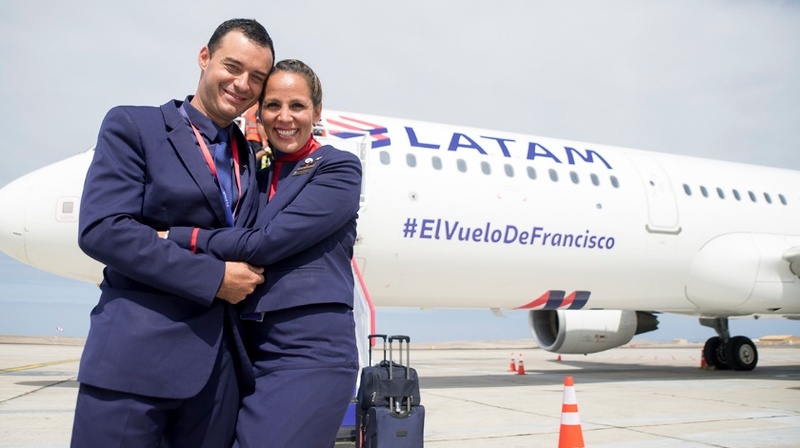 Paula Podest Ruiz and Carlos, both cabin crew managers and winners of LATAM’s ‘Service Leader’ award—the carrier’s highest distinction for employees—held their civil marriage ceremony back in 2010. “We always wanted to get married at a church. We never thought it would be the Pope that would marry us. We have received the best possible wedding gift and we are very lucky,” Paula shared. For more than 10 years, Paula and Carlos have both worked for LATAM and were chosen to attend the Supreme Pontiff during his visit to Chile. “Carlos and Paula are part of the LATAM family and were chosen to accompany the Supreme Pontiff and his delegation for their professionalism, long service and for representing the values of the company. We wish them the very best for the future,” he said. LATAM is the official carrier of Pope Francis’ first trip to Chile and Peru and is transporting the Supreme Pontiff.